This office utilizes the most advanced diagnostic techniques and equipment in detecting and monitoring the life threatening effects of Vertebral SUBLUXATION. The Millenium Subluxation Station performs surface EMG and surface Thermal scans to offer a visual images of interference within a person’s nervous system. What actually do EMG and Thermal Scans measure? The EMG, which is an abbreviation for Electromyograph, measures electrical potentials associated with muscular activity. This means it can measure and record the status of the muscles surrounding the spine, and indicate if those muscle groups being tested are in spasm, normal or even weak. 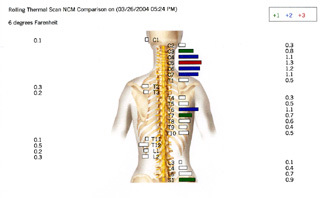 These changes or variations from the norm are most often due to Spinal SUBLUXATIONS, which not only interfere with the function of the muscles, but also decrease the stability of the spine which also results in changes in muscular activity intended to compensate for the structural weaknesses. Alterations in skin temperature patterns are associated with aberrations in the function of the autonomic nervous system. The autonomic nervous system controls the organs, glands, and blood vessels. It is responsible for relating the internal environment of the patient to the dynamics of the outside world. One important function of the autonomic nervous system is temperature regulation. When the outside environment is cool, the body will attempt to conserve heat, resulting in constriction of the arterioles in the skin. When the outside environment is warm, and the body seeks to eliminate heat, vasodilation (widening) of the arterioles in the skin will result. In a healthy patient, skin temperature patterns will be constantly changing, but symmetrical. This is because a healthy body is constantly adapting to the environment. Thermal scans can help detect “dis-ease” within the body quite often before the problems progress to the point of outward symptoms. Do either of these scans hurt or cause discomfort? Absolutely not. Both scans are non-invasive and offer no discomfort what-so-ever. How old can you be to have such a scan? Due to the birthing process and how babies are carried within the womb, 80% of all children are born with SUBLUXATIONS of their upper cervical spine. This is the only form of diagnostic equipment that can be performed on infants and small children that is also non-invasive and yet can offered a detailed evaluation of the integrity of that child’s nervous system function. We strongly suggest that infants, children, adults and senior citizens ALL have such examinations to ensure that their spine and nervous system are functioning properly. How often do you perform these exams? Well the first scans are performed during the initial examination. 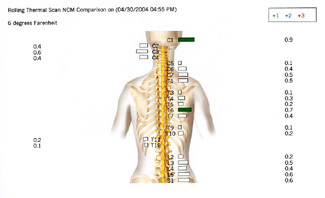 These first scans serve as starting points and future scans are compared to prior to determine progress to date and to document any areas with residual interference to the nervous systems which assists in determining the frequency of continued Chiropractic spinal adjustments. As a rule these evaluations are performed monthly so as to maintain a firm understanding of each patient’s spinal conditions. As a patient progresses and their frequency of Chiropractic care is reduced, the interims of the reevaluations will be extended to suit the patient’s treatment program. How can you tell if a person has problems and if they are responding to care? The read outs for the Subluxation Station are very easy to read, which many patients appreciate. Elevated levels of muscle spasms in the EMGs, or temperature readings in the Thermal scans, are indicated not only by numerical values but also by color. Green is indicative of mild elevations, blue refers to moderate elevations and red demonstrates severe elevations. Black bars are values so high that they exceed the current scanning range. 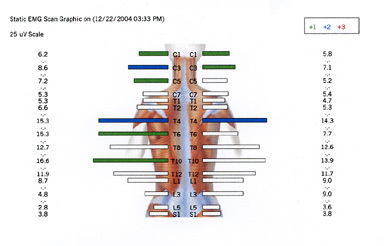 The three EMG scans shown below are an example of an actual patient’s scans. Note that with each progressive scan the values are reduced, demonstrating a positive response to treatment and a reduction of interference within their nervous system. This initial scan demonstrated extremely severe spasms of the muscles in this young girls’ mid back region. The interesting aspect of such findings was that she had NO back pain within this region. Reevaluation one month later shows a significant reduction in muscle spasms, with ALL red and black bars eliminated. The third scan one month later demonstrated an even greater return to normal with only one blue (moderate) bar remaining. Healing trends such as this are reassuring, especially when considering if a patient is improved enough to undergo a reduction in treatment frequency. 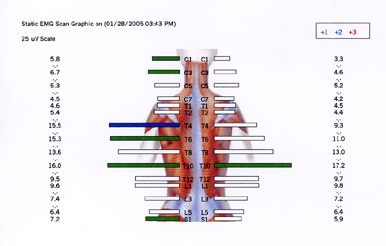 The initial Thermal scan obtained on this patient demonstrates elevated readings throughout the entire neck region on the right, in the mid thoracic region and mild elevation at the S1 spinal level on the right. Such abnormalities offer insight into the patient’s autonomic nervous system, which is the aspect of the nervous system that controls the organs and tissues within the body. 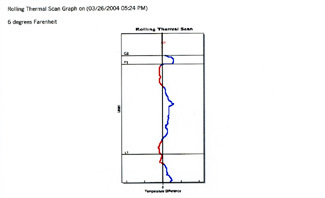 The Thermal scan that was performed just one month later demonstrates a much improved return to normal autonomic function. Just two mild elevations remain at the C1 and the T6 spinal levels. In addition to better reliability, the non-invasive nature of the test makes it more appropriate for the evaluation of abnormal recruitment patterns and dysponesis associated with vertebral SUBLUXATION. In the analysis of thermal differentials, we are concerned with two factors, symmetry and pattern. Symmetry refers to the difference in temperature between the left side and the right side, at like points along the spine. It has been demonstrated that specific temperatures vary greatly from person to person. Actual temperatures also vary in the same person from moment to moment. However, the differences in temperature from side to side are maintained within strict limits in healthy persons. Uematsu et al determined normative values based upon 90 asymptomatic "normal" individuals. These authors stated: "These values can be used as a standard in assessment of sympathetic nerve function, and the degree of asymmetry is a quantifiable indicator of dysfunction...Deviations from the normal values will allow suspicion of neurological pathology to be quantitated and therefore can improve assessment and lead to proper clinical management." (Source: Uematsu S, Edwin DH, Jankel ER, et al: "Quantification of thermal asymmetry." J Neurosurg 1988;69:552).
" Persons free of neurological interference tend to display skin temperature readings which continually change, but when the vertebral subluxation and interference to normal neurological function appear on the scene, these changing differentials become static. They no longer display normal adaptability, and at this time the patient is said to be `in pattern.'" In normal (unsubluxated) patients, thermal patterns will be constantly changing, and will exhibit acceptable symmetry. 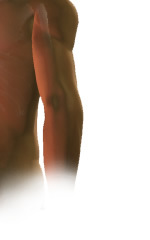 In acute and subacute subluxations, there will be levels out of range, but the pattern will vary. In chronic subluxations, the pattern will be fixed, and there will be levels out of range. Levels of asymmetry often do not relate to the level of primary subluxation. Chronic organ dysfunction (visceroautonomic) may result in a focal segmental asymmetry. 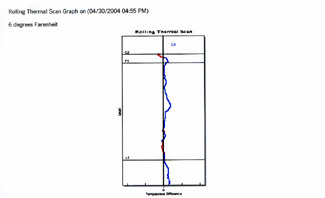 Thermal patterns measure autonomic activity. Levels of thermal asymmetry may not correlate with levels of EMG asymmetry, since EMG is measuring muscle activity, not autonomic function. These observations should be tested through formalized research. The chiropractic profession pioneered skin temperature differential analysis with the introduction of the neurocalometer over 70 years ago. 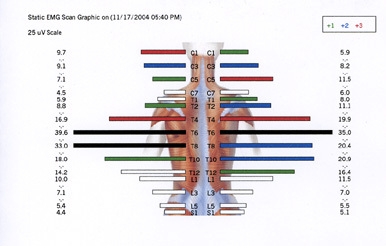 Strengthened by extensive clinical experience and ongoing research, paraspinal skin temperature differential analysis is strongly established in the practice of subluxation based chiropractic. If you are interested in scheduling an appointment to determine just how well your nervous system is functioning then please contact our office. Dr. Bajakian believes each of us deserve to KNOW the truth about our health and also our health choices. If he evaluates you and feels he can help you he will sit down with you and explain how your health can be improved through Chiropractic care. If Dr. Bajakian determines your condition is not within the scope of Chiropractic care then he will advise you of that as well, and assist you in seeking the appropriate health care specialist who will best serve you as you strive to improve your health.